Speaking at the Russia Energy Week (REW) forum, President Vladimir Putin highlighted that the country's gas exports to the EU were about to reach 200 billion cubic meters (bcm) in 2018. "We have been hearing about the reduction in Russian supplies for many years now. But in spite of this, Europe keeps increasing Russian gas imports," Novak told the forum. 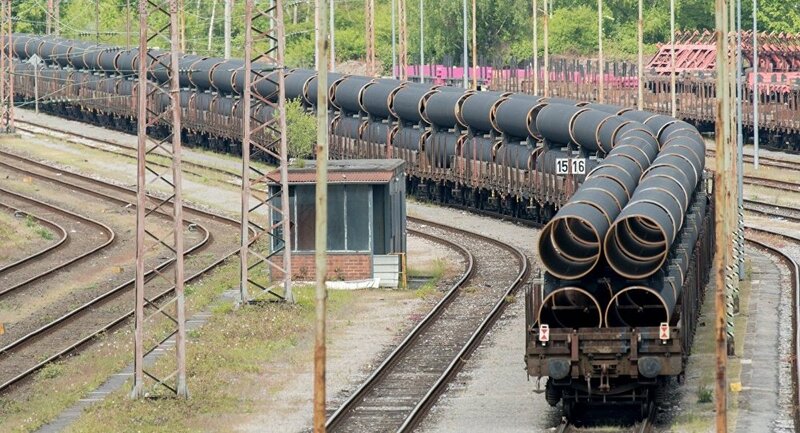 Earlier, on September 13, US Secretary of Energy Rick Perry signaled to Moscow that Washington could crack down on the country's energy projects and impose sanctions on the Russian-European Nord Stream 2 initiative. According to the US leadership, the EU's dependence on Russian hydrocarbons threatens the bloc's security. In July, Donald Trump slammed Germany for dependence on Russian gas and claimed that Berlin could soon rely on Russia for up to 70 percent of its energy, a statement which even US mainstream media sources qualified as "exaggerated." Commenting on the matter, American Interest, a bimonthly magazine focusing on US foreign policy, suggested that currently Washington possesses "two unprecedented tools to accomplish its long-term aim of easing Europe's vulnerability to Russian energy influence": First, the threat of sanctions against Moscow's pipeline project; second, the ability to export US liquefied natural gas (LNG) to Europe. Since the beginning of Trump's presidency the US administration has been actively promoting both options. On August 2, 2017, the US president signed into law the Countering America's Adversaries Through Sanctions Act (CAATSA), while on March 21, 2018, US State Department spokeswoman Heather Nauert threatened to ban the Russian-European pipeline project under the newly adopted law. On the other hand, the White House continues to pressure the EU into buying the US LNG. In late July, Trump made an announcement following a meeting with European Commission President Jean-Claude Juncker in Washington that the European bloc was "going to be a massive buyer of LNG." For his part Juncker confirmed that the EU was ready "to invest in infrastructure and new terminals which could welcome imports of LNG from the United States and elsewhere — but mainly from the United States." However, Europe buys super-chilled fuels not only from the US, which is why Trump's enthusiasm appeared to be slightly exaggerated. At the same time, the price of American LNG is considerably higher than that of pipeline gas: Addressing the REW forum, Vladimir Putin pointed out that the US' LNG imports were 30 percent more expensive than Russian gas. "I understand Donald, he's fighting for his country's interests, for his industry, and he's right to do that," the Russian president underscored. "But in this case American LNG on the European market is more expensive, not by a bit, but by 30 percent. That's way too much." Germany's Federal Foreign Ministry came to a similar conclusion: "LNG from the United States has a higher price because of the large percentage of gas obtained through non-conventional sources of production (fracking). It is currently not competitive in Germany," it summed up in a report entitled "Independence through diversification." Besides, US LNG exports to Europe are extremely modest. While Russia's Gazprom delivered a total of 194.4 billion cubic meters of gas to European countries in 2017, the US shipped just 2.26 billion cubic meters of LNG to Europe last year, according to the US Energy Information Administration (EIA). "Russia has been a very reliable supplier of gas for many decades," Royal Dutch Shell CEO Ben van Beurden told the forum, as quoted by Reuters. "The cost of supply of Russian gas is probably one of the most competitive." Patrick Pouyanne, Total's chief executive echoed Beurden and underscored the significance of Russia's own Yamal LNG project, lauding the price policy of the endeavor: "I think it's just only (the) start of the story and this will be one of the largest provinces for natural gas in the world."